A Swift framework for rapid development using a collection of utility extensions for Foundation and UIKit classes and protocols, along with associated unit tests. Cross-platform targets for iOS, watchOS, and tvOS and were used across various apps for providing a central and extensible API. 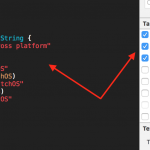 In this post, I’d like to show you how to create a Swift framework for iOS, watchOS, and tvOS and get them distributed via Carthage and CocoaPods. It’s a technique I use to share frameworks across all my apps and with the community.